On Saturday we decided to use our CoCo Key passes. We had purchased them over the winter and had given the Rudolphs tickets for Christmas. We all got together and decided we'd give it a try. 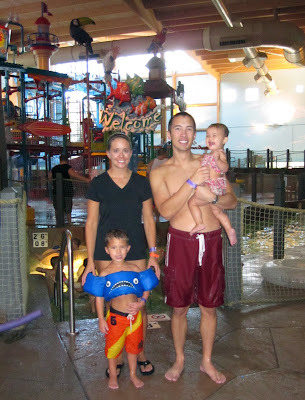 The waterpark was indoors and a lot like Great Wolf Lodge, but much smaller. We hadn't brought Paige to Great Wolf Lodge, so we thought it'd be nice to let her have a chance at some waterpark fun too. We had a lot of fun with the Rudolphs, but overall it was exhausting and not too exciting catering to the little kids' desires. Connor had no interest in the lazy river, waterslides or pools. He wanted to play "treasure hunt", which involved climbing all over the structure in the middle of the waterpark. The structure consisted of stairs and rope netting laddders. At the top of the structure were 3 neat waterslides and there were water hoses squirting water out all over you as you climbed. "Treasure hunt" consisted of climbing up one side of the structure, walking by the slides and then climbing down the other slide. I kept thinking that if I could just get him to try one of the slides, we'd all have more fun and the climbing would be worthwhile. Instead, the one time I got him to go down one of the slides he got very angry with me and cried. So we just hunted for treasure instead until Daddy couldn't take it any more. Thankfully the Rudolphs also humored him with his fun game. Paige had an equally entertaining, but much more dangerous game, in mind. Her plan was to climb up the slippery steps on the side of the baby pool, sit down, then jump back in to the water and run around. Apparently it made the game less fun if she was holding hands with anyone or had a responsible person within arm's reach. She ran up and down the sloped entry to the pool and fell numerous times. Andrea and I agreed that she probably bonked her head more in the two and a half hours at CoCo Key than she did in a normal month at home. Finally, towards the end, both kids played nicely in the baby pool and went down the slide. Allison was very good with her baby cousin and helped her go down the slide a bunch of times. Thanks to the Rudolphs for joining us!